So hey, who wants to hear how well I’m doing in the TBR Challenge? You do? Well that’s just awesome. Funnily enough, I’m doing awesome too! 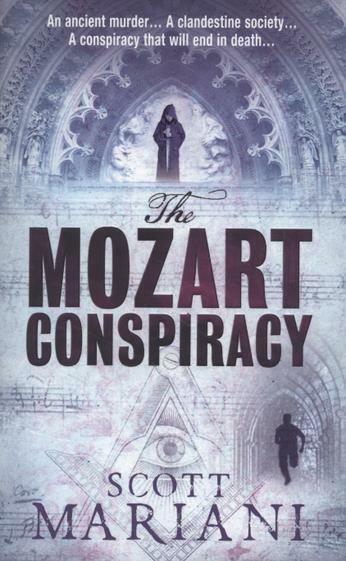 In fact, The Mozart Conspiracy is my fifth fourth (alright, so maybe not quite as awesome as I’d thought…) book this year that was on my TBR pile before 2012 and that’s nearly half. Go me and my overuse of italics! Former SAS operative Ben Hope is running for his life. Enlisted by the beautiful Leigh Llewellyn – world famous opera star and Ben’s first love – to investigate her brother’s mysterious death, Ben finds himself caught up in a centuries-old puzzle. The official line states that Oliver died whilst investigating Mozart’s death, but the facts don’t add up. Oliver’s research reveals that Mozart, a notable freemason, may have been killed by a shadowy and powerful splinter group of the cult. The only clues lie in an ancient letter, believed to have been written by Mozart himself. When Leigh and Ben receive video evidence of a ritual sacrifice being performed by hooded men, they realise that the sect is still in existence today and will stop at nothing to remain a secret. From the dreaming spires of Oxford to Venice’s labyrinthine canals, the majestic architecture of Vienna and Slovenia’s snowy mountains, Ben and Leigh must forget the past and race across Europe to uncover the truth behind THE MOZART CONSPIRACY! These books are a guilty of pleasure of mine. I’m never sure exactly what type of genre they are, but you know what I mean – action/thriller books with an intelligent, conspiracy-type base. Like The Da Vinci Code or The Medusa Amulet. There’s usually either a good-looking scholar or an ex-military man who searches for some long-lost artefact, but oh no – there’s a team of similarly ex-military backgrounded people who are also searching for the artefact, only they’re baddies so they have bigger guns. Oh, and the Freemasons are usually running about somewhere too. I don’t know why I’m making fun of them really. I own so many I could put Waterstones to shame. It’s just that they’re generally pretty awful. But you know, so awful they’re actually kind of… well, good. And you don’t need to concentrate to read the, so they’re the ultimate comfort book. I really liked the central premise – you don’t see a lot of books about conspiracies regarding famous historical composers. It’s usually biblical artefacts or art history related. Apparently there’s genuinely been a lot of conspiracy over the death of Mozart. Theoretically he died of rheumatic fever, but similar symptoms are produced when the victim ingests a certain type of poison, so it’s possible (if unlikely, in my opinion) that he didn’t die from natural causes after all. Mozart himself declared he had been poisoned but was ignored at the time, and ever since. But hey, that’s all par for the course. I don’t mean to judge a book on the genre it’s affiliated with. The Mozart Conspiracy takes a bit of getting into, but it has a fast-paced plot and reasonably developed characters, if a little generic. It does have a few twists that make it stand out from the usual and the romantic sub-plot is actually fairly subtle. I liked Leigh Llewellyn. She stood out as a well-rounded and interesting character. She’s an opera singer with a musically trained background, and so can actually contribute to the investigations. She’s not a pushover but not unnecessarily stubborn either. One of the better female book leads, I’d say. However. However, however, however. The ending is appalling. Like, really I’m-making-a-point-of-it bad. I read it and just kind of blinked in confused astonishment. It seems incredibly pointless, unless it was about a point that Mr. Mariani just couldn’t be bothered to carry through to the next book, in which case – why add it the first place? I know that seems unnecessarily cryptic, but you’ll understand what I mean if you’ve read the book. It’s terrible, honestly. Last thing – have you ever read one of those books that seems to be overly brutal for no reason than to shock? I know a lot of people said that about The Girl with the Dragon Tattoo, but The Mozart Conspiracy is just as guilty. There’s one particular scene that’s so horrific I had to dare myself to go back and make sure I’d actually read the damn thing right. It’s just… uhhh. I don’t mind a little brutality every now and again, but I do like it to fit in with the book and not just shoved in for the sake of it. So there are parts that set The Mozart Conspiracy apart – the interesting plot, the believable characters and relationship, the fast-paced action… But then there are a few horribly clichéd parts that let the side down. The Mason culpability for example, or the pointless ending. It’s worth a read, but I’d say it’s more of a library thing. Hrm, I'm not sure I'll read this one. I'm not sure I could get over the ending! Ha – a top guilty pleasure choice! When I was at university I read a few of Dan Brown's books in a row because they were like a rest for my brain after writing essays but they were sufficiently fakely (should be a word!) historical that I could dupe my tired brain into thinking it was still engaged. Crafty, no? I did read a few others (whose names all escape me because I'm trying to remember them with the intention of insulting them) but the older and more cantankerous I get, the more I moan. I'm fun like that! But then I read The Lost Symbol last year and it was as though I'd just run out of patience with the whole genre. Actually, I think that might be because it's just appallingly written but it did also have more than its fair share of skulking Masons so I'm saying that it's the same thing as this! I read all of Dan Brown's books when I was about 15 and haven't had the urge to reread them since, to be honest. I didn't find The Lost Symbol really – it was better than Digital Fortress and… the other one, at least. That's why I like them! You KNOW they're not really educational but a tiny bit of your brain secretly thinks they are, so you can lie back and relax with a job well done! The repair of cracks in masonry walls commences by raking out the mortar or plaster. This is done to a depth of two inches.